Fresh from four days at the Writers’ Institute conference in Madison—wait, let me amend that, because quite frankly, after four days of conferencing, there’s nothing fresh about me! I am exhausted. Physically, mentally, emotionally. My mind is overflowing with industry information. You know how you need a vacation after your vacation? Well, I’m going to need a conference following that conference! I have so many hand-outs and notes from the fabulous sessions and amazing panel discussions to sift through… not to mention the two requests for my full manuscript. *Whoa* I am dizzy with emotion. One of the messages they really press upon you at this writers’ conference is to make use of the people in attendance. The “they” who are pressing this message are the professionals–published authors, editors, agents, professors and publishers. People in the know who know people. You know what I’m saying; it really can come down to who you know. And opportunities like the Writers’ Conference give you plenty of opportunity to get to know people, to network. What better place to meet people like yourself that share your passion? I have made some amazing friends through UW conferences… and you know how that goes, they have friends and they have friends and so on and so on. We’re building platforms, expanding our potential reading audience and more importantly meeting people who know what we’re going through—people who can coach us through the rough spots, the doubts, the blocks, and also support, teach and inspire. As overwhelming as it may be, I look forward to going through my notes and experiencing the conference anew, at home, where I have the time to really appreciate what they have shared. I am eager to apply my newly learned lessons to the pages of my book. I thought it was good enough to pitch; now I shall make it great enough to submit. Big props to Laurie Scheer* and her team of amazing friends, cohorts, connections, professionals, publishers, professors, agents, editors, interns, screenwriters, producers, writes, designers, lackeys, house elves, and everyone involved in the Annual Writers’ Institute. 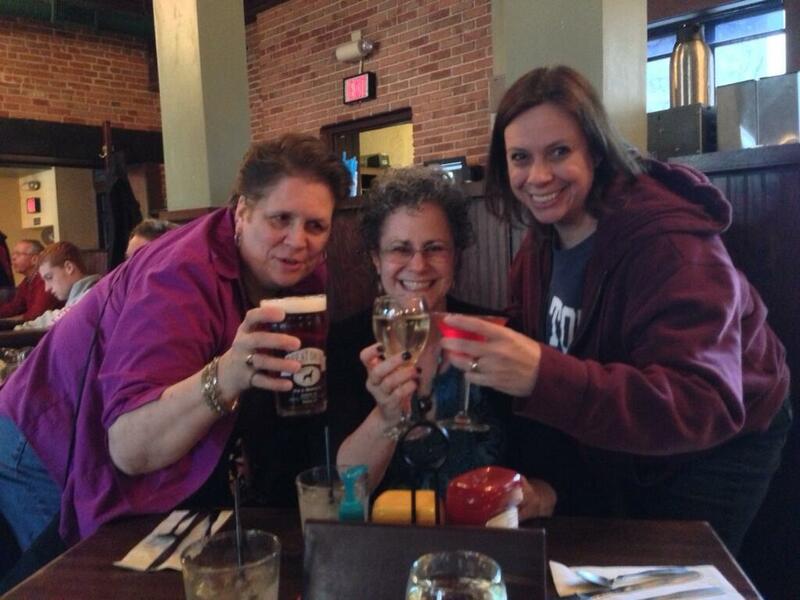 Celebrating a successful conference with my author posse. *In Print is honored to offer workshops by Laurie Scheer in the fall of 2013. I cannot emphasize enough what an awesome opportunity this is for writers of all abilities, genres, and experience! Sign up, you will be glad you did. This entry was posted in It's all about me, Writing and tagged author, conference, Laurie Scheer, Madison, Mary Lamphere, networking, UWWI, Writers Institute. Bookmark the permalink. Ditto on everything you said. Amazing conference, amazing people, amazing author posse!